Airbags can kill or injure a child in a child seat. Never place a rear-facing child seat in front of an active airbag. If you must use a forward-facing child seat in the front seat, move the vehicle seat upon which the child seat is installed all the way back. When possible, all children age 12 and under should be properly restrained in a rear seating position. If all children cannot be seated and restrained properly in a rear seating position, properly restrain the largest child in the front seat. 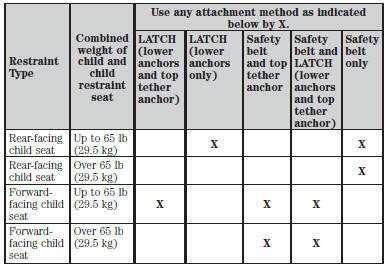 Always carefully follow the instructions and warnings provided by the manufacturer of any child restraint to determine if the restraint device is appropriate for your child’s size, height, weight, or age. Follow the child restraint manufacturer’s instructions and warnings provided for installation and use in conjunction with the instructions and warnings provided by your vehicle manufacturer. A safety seat that is improperly installed or utilized, is inappropriate for your child’s height, age or weight, or does not properly fit the child, may increase the risk of serious injury or death. : Never let a passenger hold a child on his or her lap while your vehicle is moving. The passenger cannot protect the child from injury in a crash, which may result in serious injury or death. Never use pillows, books, or towels to boost a child. They can slide around and increase the likelihood of injury or death in a crash. Always restrain an unoccupied child seat or booster seat. These objects may become projectiles in a crash or sudden stop, which may increase the risk of serious injury. To avoid risk of injury, do not leave children or pets unattended in your vehicle. The child seat must rest tightly against the vehicle seat upon which it is installed. It may be necessary to lift or remove the head restraint. See the Seats chapter for information on head restraints.